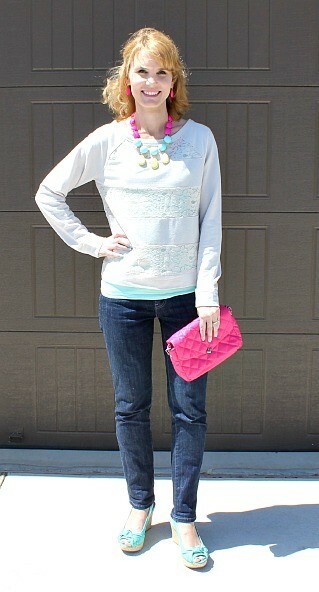 Today’s Cute Outfit Ideas is all about color and how you can dress up a sweatshirt and a pair of jeans. I am now declaring this one of my favorite outfits ever! This outfit all started with a Lauren Conrad sweatshirt I purchased from Kohl’s for $5 off the clearance rack. Yes. Five dollars! I’m sorry to say it’s not on their website, but it’s an oatmeal colored sweatshirt with lace. I paired it with a mint cami underneath so some color peeks through. I’m also wearing Levi’s mid-rise denim,which are so comfortable. I love the dark wash. It dresses the outfit up quite a bit. The pink earrings came with the necklace and I will definitely get a lot of use out of those. I love to add a pop of color to my outfits with earrings. Because I was on a roll with this color challenge and since it’s Spring, I added even more color with a pair of blue Apt. 9 wedges and my gorgeous bright pink Vera Wang clutch. Let’s just appreciate these shoes and clutch for a minute, shall we…. Just like yesterday’s Style feature, this outfit all started with two basics – a sweatshirt and a pair of jeans. After that, I just experimented and added on from there. Have fun with it! Try on more than one pair of shoes. Step out of your fashion comfort zone. And for the love of everything good, great and perfect – do not worry about what those other moms will think. Dress up. Dress down. Dress sideways. Just feel good. Mmmmkay?